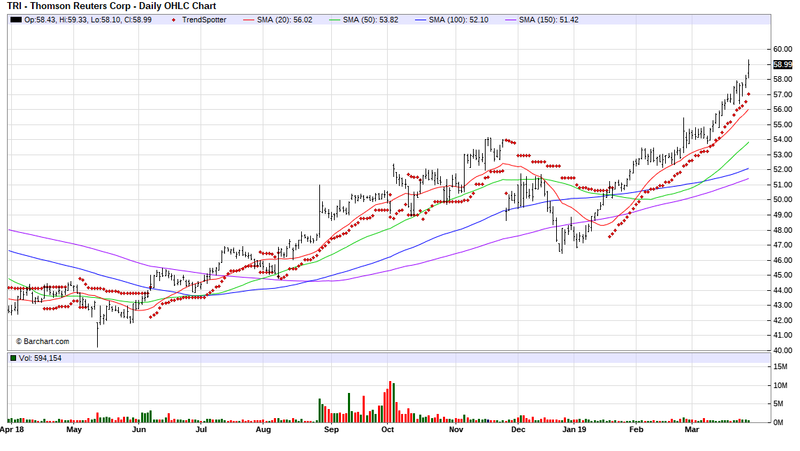 The Barchart Chart of the Day belong to the business information company Thomas Reuters (TRI). I found the stock n=by using Barchart to screen for stocks having a Weighted Alpha of 34.00+ and a technical buy signals of 80% or more. The resulted in a list of 151 stocks. I sorted that list for the most frequent number of new highs in the last month, then used the Flipchart feature to review the chart for consistent price appreciation. Since the Trend Spotter signaled a buy on 1/23 the stock gained 15.37%. Thomson Corporation is a leading provider of value-added information and technology to users in the fields of law, tax, accounting, financial services, higher education, reference information, corporate training and assessment, scientific research and healthcare.